Take a Mary Poppins tour of London and discover the iconic scenes that feature so strongly in both films. While drifting through the sky holding a parrot headed umbrella is not possible, you can explore the places Mary Poppins visits. London and Mary Poppins fit together like strawberries and cream. It is impossible to think of Mary Poppins without thinking of London. So, if you are staying at any of the hotels in south Kensington London, you must visit these places. Stand on the steps of St Paul’s Cathedral and feed the pigeons or zoom off in the wake of Jack the Lamplighter through the adjacent garden. Stroll past Traitors Gate at the Tower of London where Jack rides his bike with Tower Bridge in the background. The traffic may be modern, but the Bank of England and Threadneedle Street is instantly recognizable. This is where John Banks caused chaos with the notorious run on the funds of the Fidelity Fiduciary Bank. Later, he manages to fly a kite through a window. If you want to see the buses filmed driving around the Bank, head for the London Transport Museum in Covent Garden. Several of their historic vehicles were involved in many of the exterior scenes bringing 1930’s London to life. A few minutes walk takes you to Trafalgar Square and the entrance to the Mall where Mary Poppins, Jack the Lamplighter and the children experience a very unusual bike ride. They even attempt to turn back time, with dramatic bike chases around the statue of Queen Victoria outside Buckingham Palace and down to the Houses of Parliament. Marvel at the sight of Big Ben, and think about Jack and his lamplighter friends trying to scale the tower. Take a tube journey over to Chelsea from our hotel South Kensington and find the plaque marking the house where P J Travers created her wonderful characters and brought Mary Poppins into the hearts of children and adults everywhere. 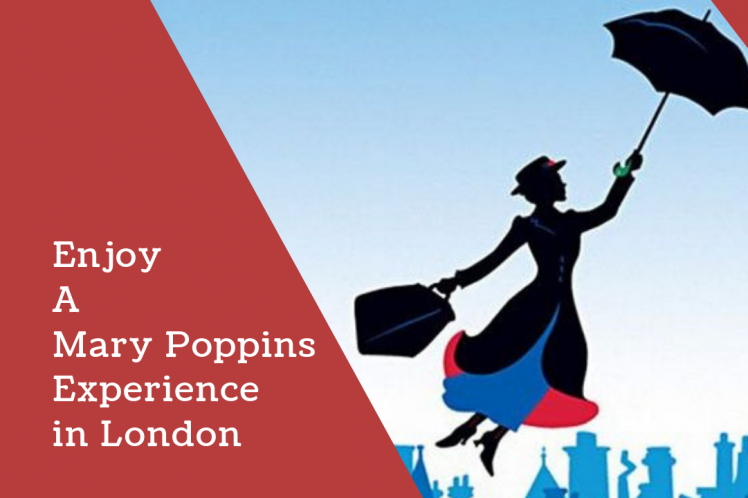 Complete your Mary Poppins tour over at Regents Park. This is where Mary Poppins was filmed jumping into a pavement picture on her way to a Jolly Holiday complete with carousel ride and animated penguins. To see some real-life penguins, head for London Zoo at the far side of Regents Park. Along the way, admire the flowerbeds and walkways used by Mary Poppins to take the children for their daily walk. And of course, don’t forget to go fly a kite on Primrose Hill!